As i get this quesion quite often, i thought i could answer it for the whole world... in form of a PAINTING JAM! YEAH! 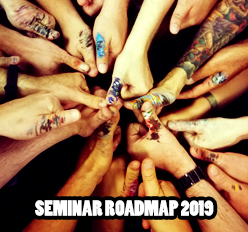 This time we will talk about my style or idea of painting reds (as on most of my newer Blood Angels), painting OSL effects and a short trip in the world of painting black. Hi! I have been looking at your Blood Angle army for a long time now and I have decided that I want to try to make my own army. I am a very novice painter, so looking at your models is pretty daunting. I have a few questions on how you painted your army ( http://www.coolminiornot.org/249885 ) if you have some spare time. 1. How did you paint your red? It is by far the best looking red that i have seen on a blood angels army. Looks very high quality without being too bright red. 2. How did you paint the eyes? I think the green eyes add so much to the red armor. Makes the squad appear really intimidating. 3. How did you paint the plasma ( WOW!). Insanely cool! I would put plasma on every model I could, if i could paint that. I know that that is a lot of questions and would probably need a lengthy response, but if you can give me any insight or any tips. It would help a lot. Thanks! Here you can see one of my Blood Angels. To the right i made gradients of the colors i used. You will immediately notice that my red (Fig. 1) starts with almost pure Chaos Black (a little drop of Blood Red) over a minimal desaturated Blood Red into Dwarf Flesh. When i paint it i start with a base coat of the desaturated Red, paint the Shadows with glazes, and then add the highlights. The Green (Fig. 3) for the Lenses i painted with Catachan Green+Goblin Green, Midtone was Goblin Green, into Scorpion Green and finally Scorpion Green+Bleached Bone. So far for the used colors. The thing that is important here, and that is visible in Fig. 1 & Fig. 4.4, that the highlight with Dwarf Flesh (And on a even smaller spot sometimes Dwarf Flesh + Bleached Bone) is very small spot and not a regular gradient. I do this so that red is the most dominant midtone-highlight. Only on edges and fine spots i used the Dwarf Flesh. As you can see here, the red looks more like a soft reddish pink. This is used very often and gives the Red a very Orange looking style. I don't like it because it looks like orange and not like red to me. And the last two Figures.... here you can clearly see why it is so important to paint small highlights. There are the same colors used, but the gloss is different. On Fig. 4.5 it looks like a rich and deep black that you can use for example for Death Company Marines. On Fig. 4.6 there are the same colors used, but the gradient is a regular one, it makes the "black" look more like a gray. You can see this very very often when people try to paint black. To paint black, set very small highlights, if your strongest highlight is white, do it with a very small spot. 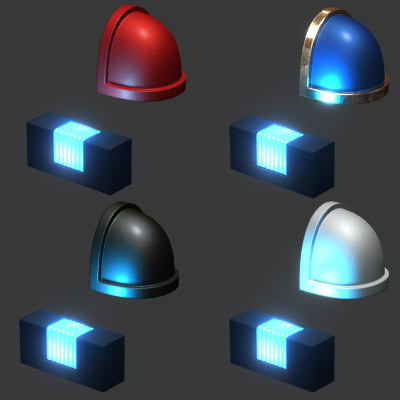 Now onto the blue OSL (Object Source Lighting) glow... At first i have to say, we already have a OSL tutorial, this section here is pretty specialized on the one effect. For the glow on the Gun, i just painted a regular gradient, but on the armor i painted a gradient with the shadow color to the midtone and a very small spot of the highlight. You can see this effect best on his chest. The most important thing when painting OSL effects is that you have to think about the light situation on the mini. That is sometimes very hard to really realize this on a miniature. When you paint OSL you "paint light". It's very different from painting colors. 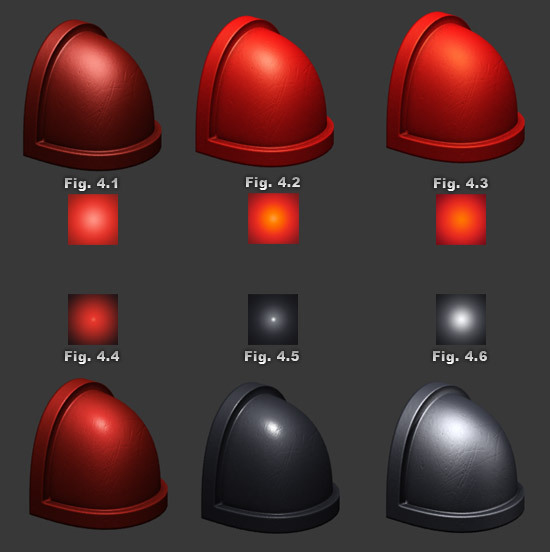 Here you can see how the same light source behaves different on different materials. What's also important is the color of the light. When you have a blue light effect on red armor it's not that strong like a pure white light source. You can also notice this effect on the illustration above. Awesome, Picster! I hope you expand your Blood Angels FAQ to include the Baal Predator that you painted. One of these days I hope you get your hands on some of the new BA models because I'd love to see you paint them. Very clear, and super informative! Thanks for taking the time to give the examples. Even if you think of it is theory, showing things separate and clear like that explains a lot more then you think. 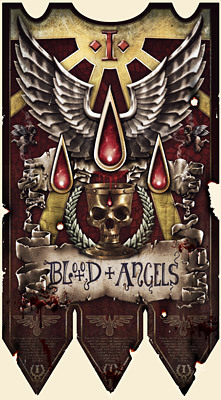 Your Blood Angels inspire me with my own Angels Sanguine. Thanks again! 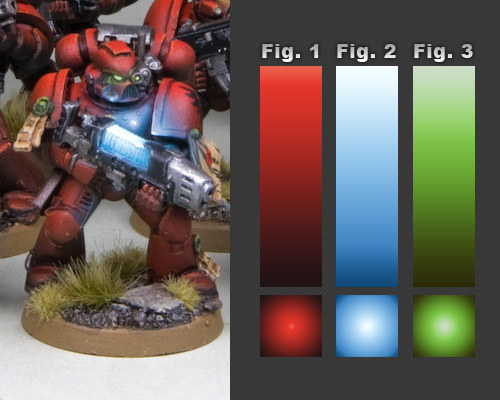 Excellent use of computer generated graphics to visualize some aspects of painting light on your miniatures. Alter Falter, excuse me for that german expression but that is awsome. My mouth poped open when I saw that painting jam. It is very easy to read and to understand. Your use of the graphics is great. Genuine Tut! Insanely professional tutorial. Looks like a tut that consumed a lot of your time. Did you paint it Raffa? And... can i borrow it for my Chapter Standard Bearer? ich finde die Anleitung für 4.4 nicht finden. Hab ich was uberlesen?